Bootleggger’s brewing facility, they were bottling Old World Hef when we showed up. Chris, Audrey and I showed up at 8 am along with other members of the press to get a sneak preview of the brewing process for this Imperial Red Ale. Cameron Collins, (founder and co-creator of the OC Brew Ha Ha), greeted us with bagels and donuts and let us know that the brewers were already hard at work and had been since about 5 in the morning. Jerrod was adding two-row malt to the mill as we walked into the brewery. Once the milling was completed Cameron Collins gathered up the brewers and introduced them to us. Aaron welcomed us to his brewing facility and told us a bit about their brew day so far. They were brewing the Hop Monster beer in four, 7 barrel batches.They started batch one at about 5:00 am and would be continuing to brew as we took photos, and asked questions. 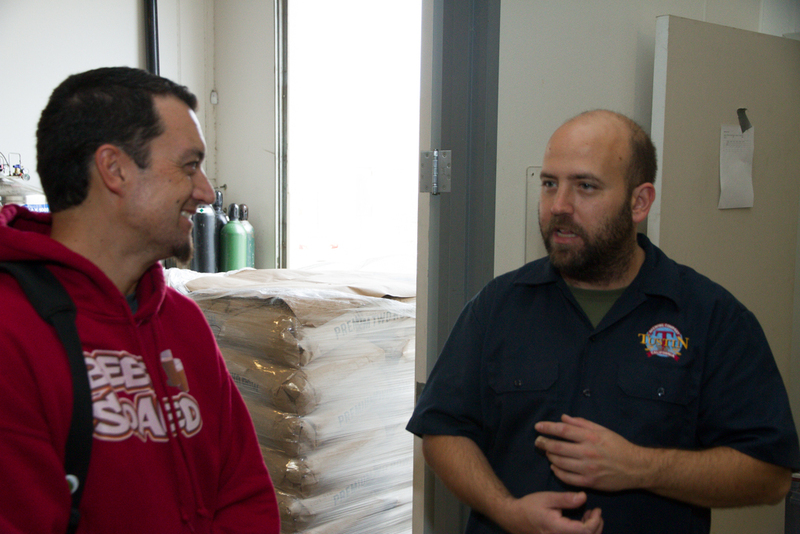 BeerSoaked Erik talking with Jerrod about Tustin Brewing’s upcoming 17th Anniversary celebration. When I talked with Jerrod he made sure to mention that the Tustin Brewing Company 17th Anniversary Party was about a month away on Sunday, August 25th. 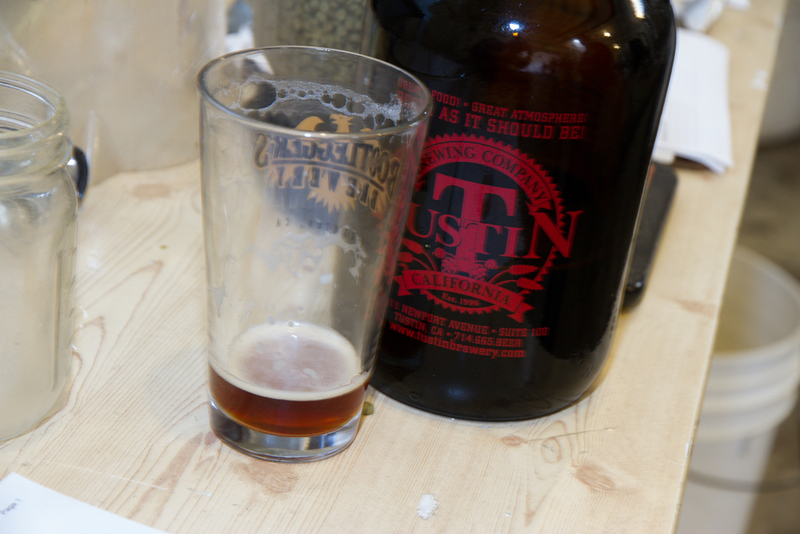 In addition to his excellent line up of Tustin brews he’ll be featuring beers from other local breweries as well. He even brewed up a special DIPA for the event featuring Mosaic hops and is really looking forward to sharing that with folks at the anniversary party. I asked him what his favorite style of beer to brew was and he didn’t hesitate when he answered “IPA.” Jerrod also brought along a growler of “The Other Woman” to share with us while they brewed. It’s an imperial red that he currently has on tap at Tustin Brewing and it was pretty amazing. It has a rich malt character and is hop forward. It’s currently available in growlers and I suggest that you head over and fill ‘er up. It’s a big hoppy red ale, and a different recipe than the Brew Ha Ha Hop Monster. I have to admit that watching these guys brew together was pretty cool for me. I’ve home brewed for a few years, so seeing the same techniques put to use on a much larger scale was not only impressive, but also inspiring. I’ll let the pictures tell the story of how much fun they were having. Evan from Cismontane was really enjoying his brew day at Bootleggers. He seemed to be goofing around every chance he got and he was trying to make everybody laugh. When I had a moment to chat with him I asked about the mountain bike rides that I’ve seen advertised on the Cismontane Facebook page. Evan said that not only does he ride, but he usually leads the rides along with the folks from The Path bike shop and they are great guys to ride with who really know their stuff. They ride Wednesdays after work, and usually have a beer afterwards. Check the facebook page for details. When craft beer brewers get together good things happen. Although they were having fun the whole time, they paid close attention to their timers, measurements and the overall quality of the beer. It’s sure to be another fantastic collaboration beer. The brew day was on Friday, July 26th and the goal is for the OC Brew Ha Ha Hop Monster to be available in bottles and on tap at craft beer tasting rooms, restaurants and bars throughout Southern California around August 23, just two weeks prior to the OC Brew Ha Ha on September 7th. “We wanted the Brew Ha Ha Hop Monster to release prior to the event because we want to create excitement for the the attendees and fans of the breweries. Fans of craft beer will be getting a preview of what’s to come by sitting down with a pint of this Monstrous Imperial Red! The 2013 OC Brew Ha Ha is going to be incredible!” – Cameron Collins, Founding Partner and Co-Producer of OC Brew Ha Ha Festivals. This entry was posted in Ale, Brewery, Craft Brew, Events, Imperial, Red and tagged Bootleggers, Brewhaha, Cismontane, Collaboration, Hop Monster, Imperial, OC, Red, Tustin Brewing by Erik. Bookmark the permalink.